Museum of New Zealand Te Papa Tongarewa - No photographers in Revell Street? "A Canterbury Album" by Joan Woodward, 1987. Mr Tait, of the well-known firm of Tait Bros., of Dunedin, has opened a photographic gallery in Revell street [Hokitika], opposite the Prince of Wales Opera House. 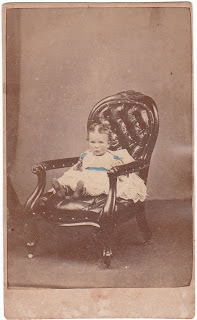 The specimens he exhibits display the very perfection of photographic art. They are finely lined and delicately finished, and testify both to the excellence of his apparatus and his own skill as an artist. 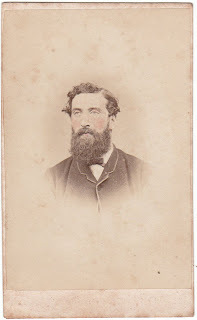 Mr Tait has already taken cartes of many of our residents and well known visitors, and the fidelity of the likeness will be at once recognised. 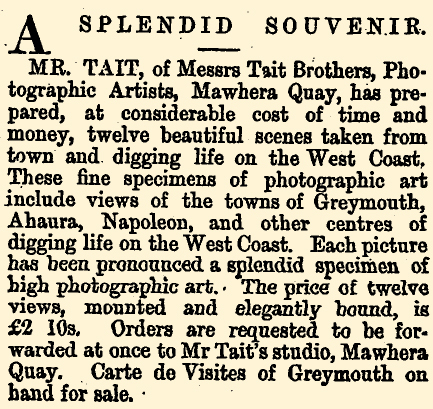 Messrs Tait Brothers, the photographers, have succeeded in taking a panoramic view of the town of Greymouth and the scenery beyond, a copy of which has been sent us. The view is in the best style of photographic delineation, and makes a pretty picture. It is taken from the South Spit, and includes a full view of the town, river, and shipping, with a glimpse of Cobden. The hills behind the gorge stand out in good relief, and the summit of the snow-clad range beyond adds to the pictorial effect. 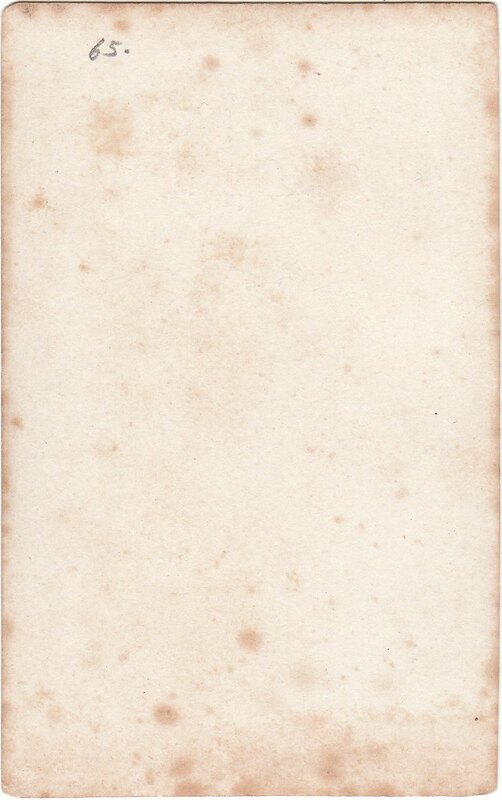 This print cannot fail to be appreciated as a picturesque view of the town, and will, no doubt, find numerous purchasers. 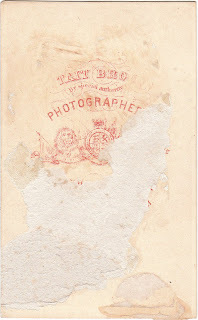 We have to acknowledge the receipt from Messrs Tait Brothers, of Hokitika, of a copy of a photograph of the Steam-tug Dispatch, as she now lies on the spit at Hokitika. The photograph is a good one, and it will probably be interesting to all who are concerned in the stranded vessel. 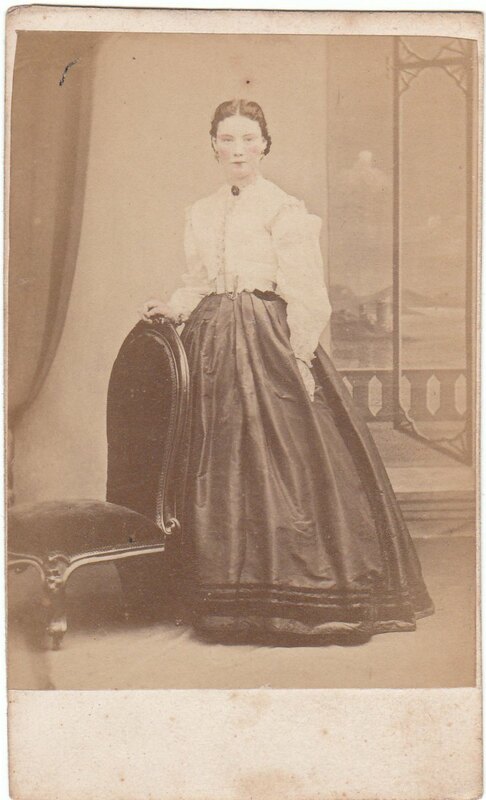 Copies may be obtained from the photographers, and those who wish to inspect one can do so at this office. 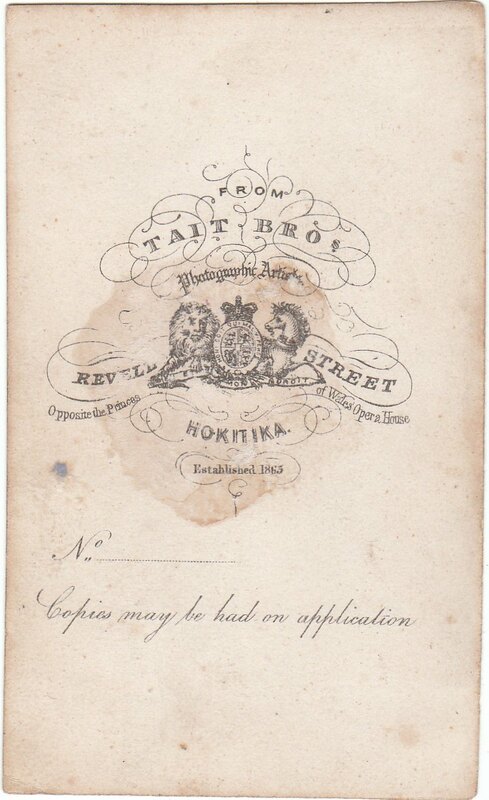 Photography appears to be making considerable progress in Hokitika, and the productions of our photographic artists, Messrs Tait Brothers and Mr Perkins, would compare favorably with those of artists in the same line, not only in New Zealand, but in the other colonies. 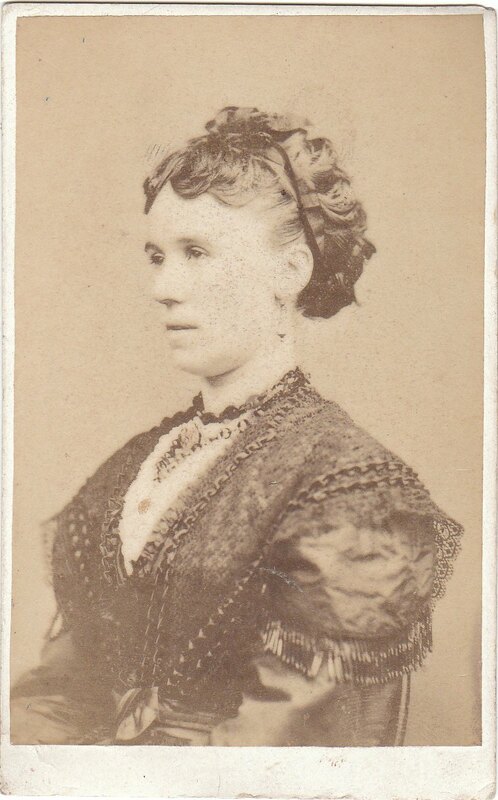 Both have beautifully executed photographic portraits, and capital collections of views. A short time since, Messrs Mundy and Co., Photographic Artists, of Christchurch, travelled from Lyttelton to Hokitika, taking photographs of the most remarkable points of view on the road. 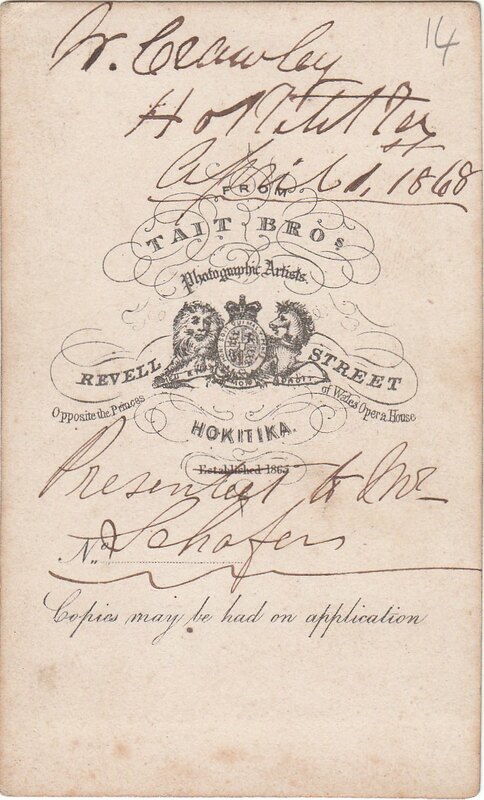 The views of Westland scenery - particularly those taken in the Otira gorge - were splendidly executed, and many copies of the whole series have lately been disposed of, on the Art Union principle. There is now being exhibited at the establishment of Messrs Tait Bros., the eminent photographers of this city, a magnificent collection of the heads of the people all being photographed in the studio of the above well known firm. They are arranged in the most artistic fashion, and reflect the highest credit on the artists. We do not hesitate in saying that the entire picture compares most favorably with those produced by the artists in the old country, and certainly equal to any thing hitherto produced in the colonies. As a work of art it is really very excellent, and well worth the inspection of the public. 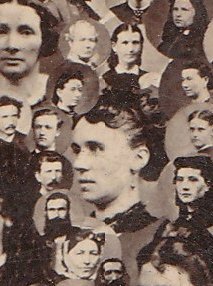 Among the photographs in the group are very many familiar faces residing here, and likewise those that are deceased, or left these shores, rendering the picture at once very interesting. 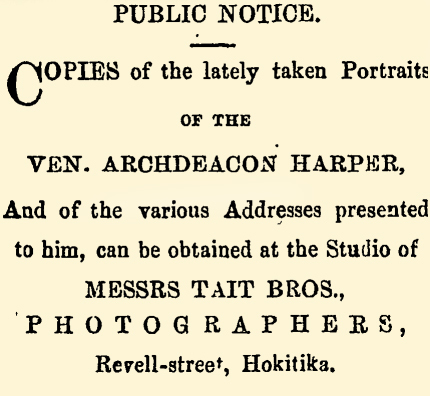 The photographic art is practised with great excellence in Hokitika, as may be seen on visiting the studios of Messrs Tait Bros and Messrs Rudolph, Haigh, and Co [sic]. In the former there are portraits of great beauty and faithfulness, taken by the zenuotype process which resembles an ex-minature on ivory, and several remarkably well-executed views of Westland and Australian scenery. In the latter the groups of figures are artistically posed, and the coloring is true to nature. There are also several striking photographs of local scenery. 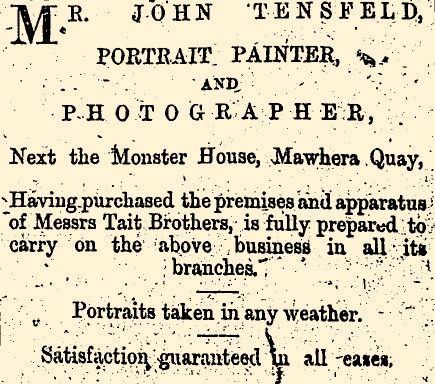 A new photographic establishment has been opened in town by Messrs Tait Bros., of Hokitika. The saloon has been erected over the new shops of Mr Badger, on Mawhera Quay, and has been elegantly and conveniently fitted up, both for the requirements of the profession and for the comfort of visitors. 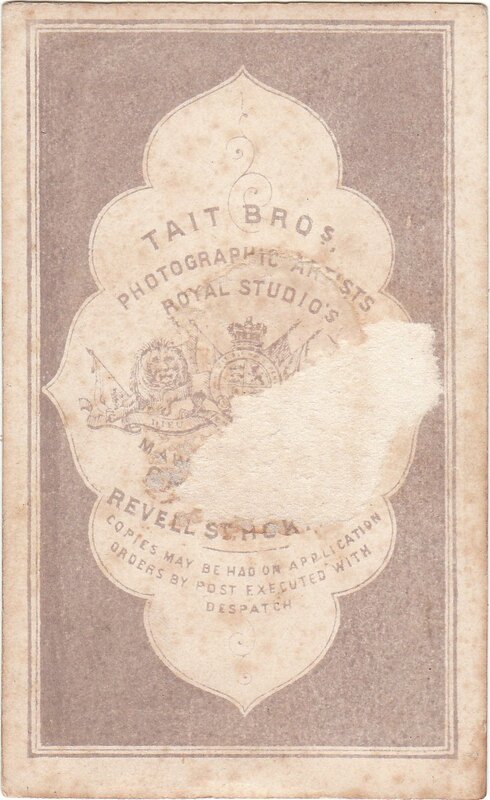 Messrs Tait Bros, were formerly in business here, and then acquired a reputation for the excellence of their artistic productions, which will now materially aid the member of the firm who has determined permanently to reside amongst us. 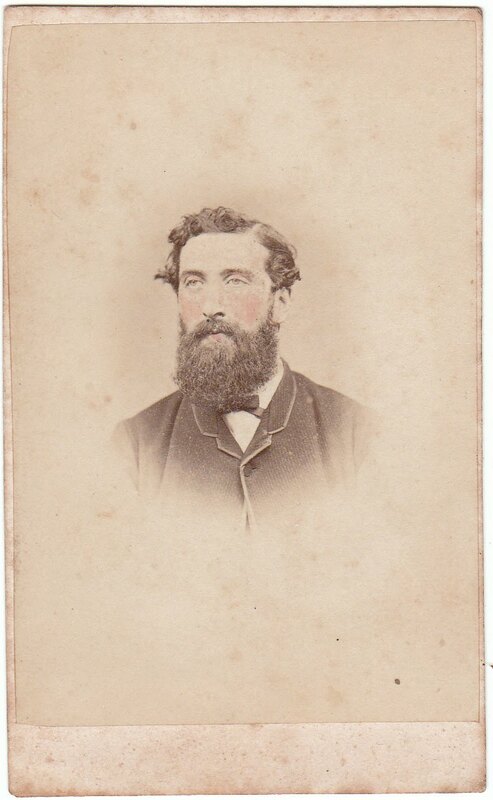 On many occasions we have had just grounds for complimenting our talented fellow townsmen, Messrs Tait Bros, on their artistic talent, but we never had greater reason to do so than in connection with a gallery of portraits, if we may use the expression, that they have just completed of the members of the Hokitika Borough Council, prior to its recent reconstruction. 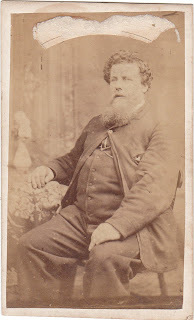 The Mayor (C. E. Button, Esq. ), is the central figure of the group, and both this likeness and those of the surrounding Councillors are, in the strictest sense of the word, life-like. The artists in question present the whole to the Council, and they could not have chosen a better mode of perpetuating the memory of those represented, and at the same time giving lasting proof of their skill in the photographic art. The frame is exceedingly tasteful, and is made of local wood (red pine) varnished and polished to perfection. Altogether the gift is a very handsome one, and will, no doubt, be highly appreciated by the Corporation. 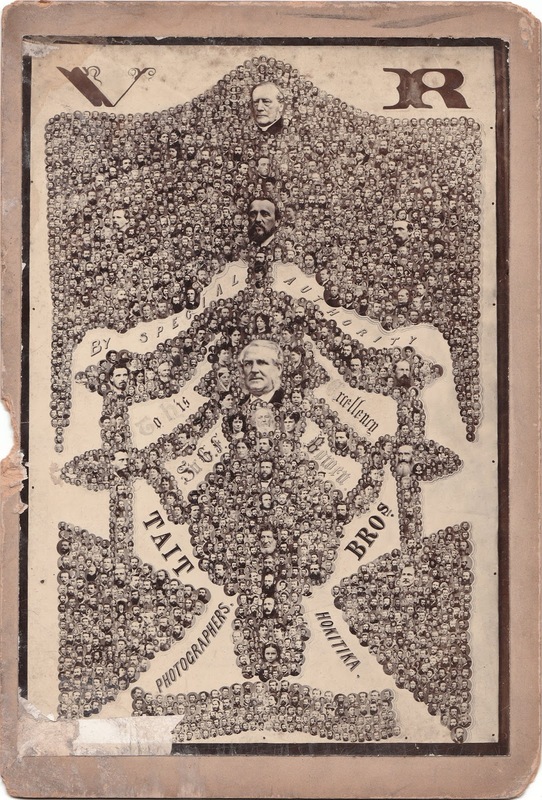 We omitted to state that at the lower corners of the picture very excellent likenesses of Mr J. Lazar, Town Clerk, and Mr Frew, Town Surveyor, are introduced. 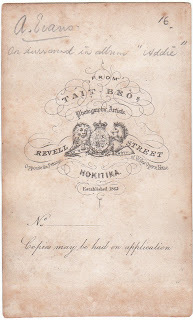 In 1869 Tait Bros. studio was located in Mawhera Quay, Greymouth between the Bank of Australasia and Union Bank of Australia. First — Freehold section 229, Revell street, on which is erected those spacious premises known as Messrs Tait Bros., Photographic Studio, adjoining Mr Price's Butchery Establishment, and opposite the Duke of Edinburgh Theatre, showy plate-glass front and doors, lined with T and G boards, highly finished through-out. 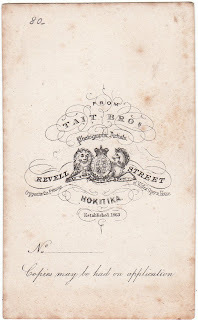 Second — Section 38, Revell-street, on which is erected the buildings known as the Hokitika Hospital Reception Rooms. Third— Section 1,463, 33 x 166 North Revell-street, with five- roomed house erected thereon, lately in the occupation of Mr G. W. Binney. Fourth — Two-roomed Cottage behind the Catholic Church, double frontage, let to a highly respectable tenant. In consequence of the continued ill-health of one of the firm, the above choice properties will be sold Without Reserve — Terms at sale. Titles perfect. 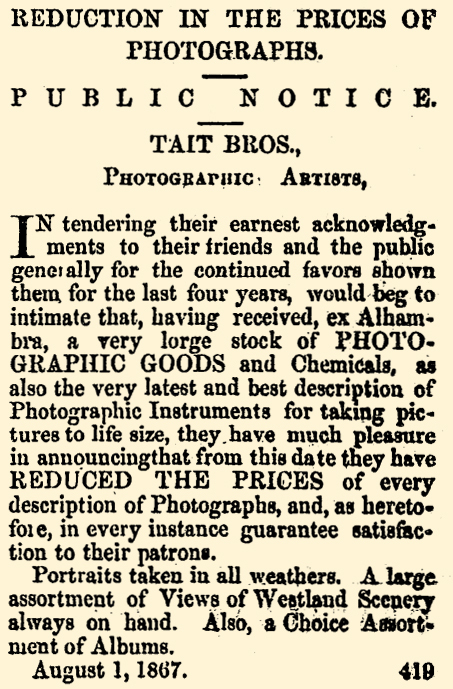 Also, in the early part of the week, the whole of the expensive and rare Photographic Instruments and materials. Full particulars in Saturday's issue, the lots now being catalogued. 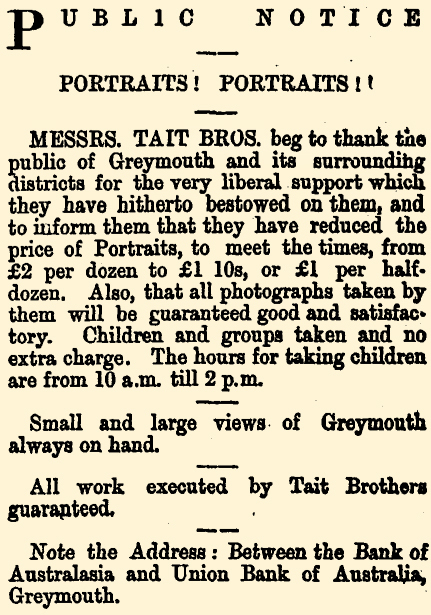 We are glad to learn that Messrs Tait Brothers, photographers, are not going to leave the Coast. 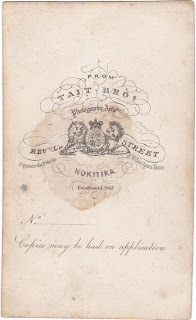 Owing to the illness of the partner residing here it had been decided by the firm to sell off their properly, but fortunately for the public, Mr Tait is improved in health, and has decided on remaining. 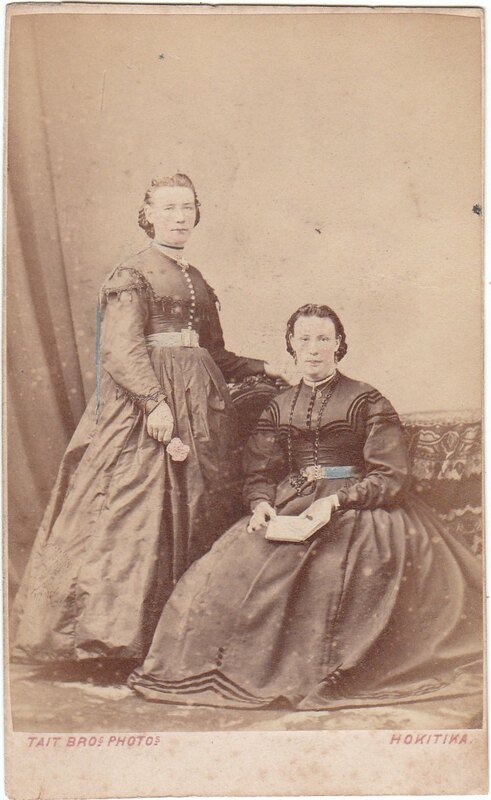 The Messrs. Tait were the first photographers who visited the Coast, in fact arrived with the earliest settlers, and since then they have enjoyed a large share of the public, patronage. This has been deserved, for they have spared no expense in their establishment, and at all times have been the first to introduce improvements in the photographic art. Recently some excellent views have been taken of the magnificent scenery around Hokitika, which are always on view, and we would recommend those who wish to pass a pleasant half hour to visit the studio of these gentlemen. 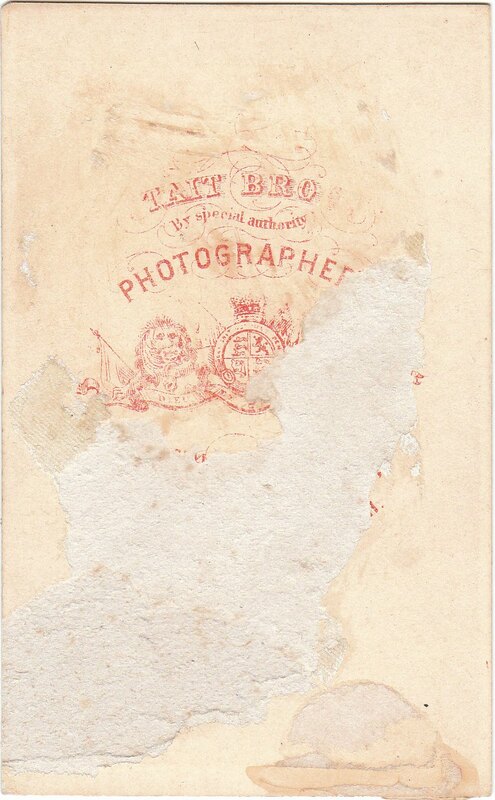 In April 1870 Tait Brothers sent a photographer on a trip to Martin's Bay on the steamer "Waipara". ...By the way, I was nearly forgetting our artist. A more persevering attempt to secure the beauties of nature in a photograph I never yet witnessed. At intervals during the day, toiling in almost inaccessible regions, our worthy little artist was seen, carrying in his train his never absent staff of sand flies. What peculiar attraction he had I don't know whether they were suffering from some local scourge and flew to him for aid I cannot say but at times it was hardly safe to get near him, and when at last he succeeded in emerging from their close acquaintanceship which he most perseveringly shunned, the woebegone picture he presented was something ludicrous. 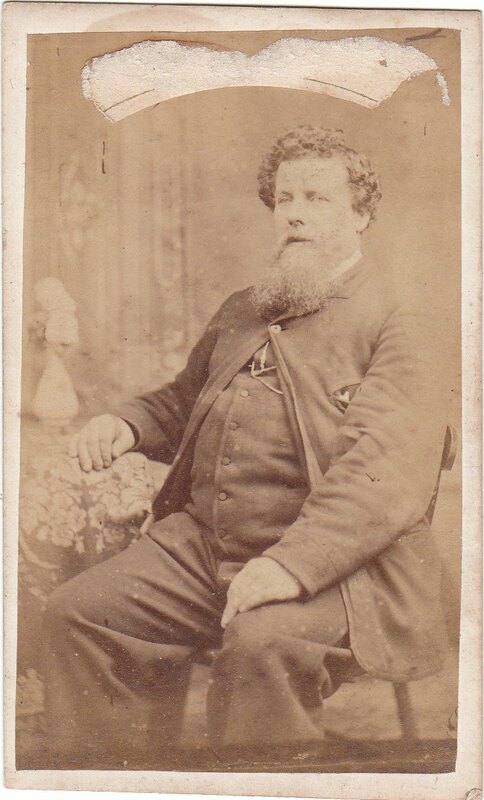 Messrs Tait Brothers are at present engaged in preparing for sale copies of a very handsome album, containing views both of town and up-country scenery. The majority of the views are well taken and artistically finished. 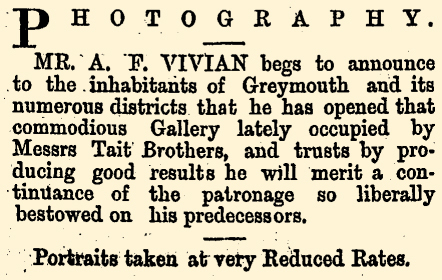 It is the finest work of the kind yet offered to the Greymouth public, and will, no doubt, secure a large sale. 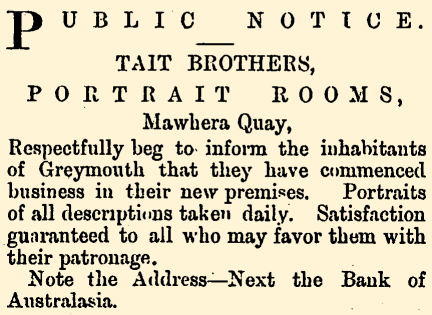 We would recommend visitors to town during the Christmas week, if they wish, a treat, to spend an hour in the photographic studio of Messrs Tait Brothers, Mawhera Quay, where they will be able to inspect a series of the finest views that possibly could be executed of scenes throughout Westland and in the Nelson Province. They are thorough gems, and will well repay a visit. 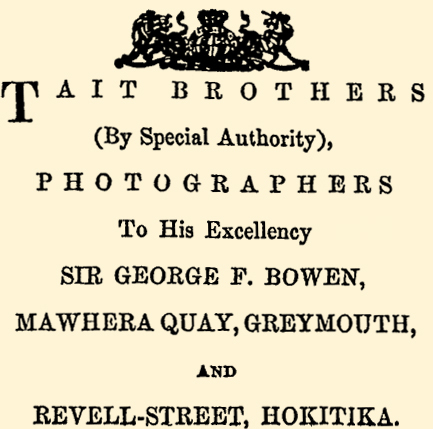 We understand that Messrs Tait Brothers, of Hokitika and Greymouth, have received authority to announce themselves as photographers to His Excellency the Governor [Sir George Ferguson Bowen GCMG]. 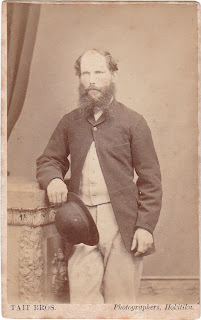 While in Hokitika, His Excellency had some portraits taken by Messrs Tait Brothers, and, by the portrait which has been presented to us by the firm, the likeness is an excellent one, and a very perfect specimen of the photographic art. 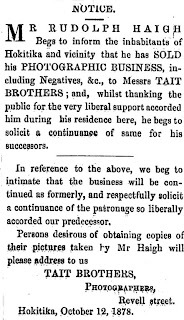 We notice that Mr Haigh also advertises himself as photographer to His Excellency, "by special authority." 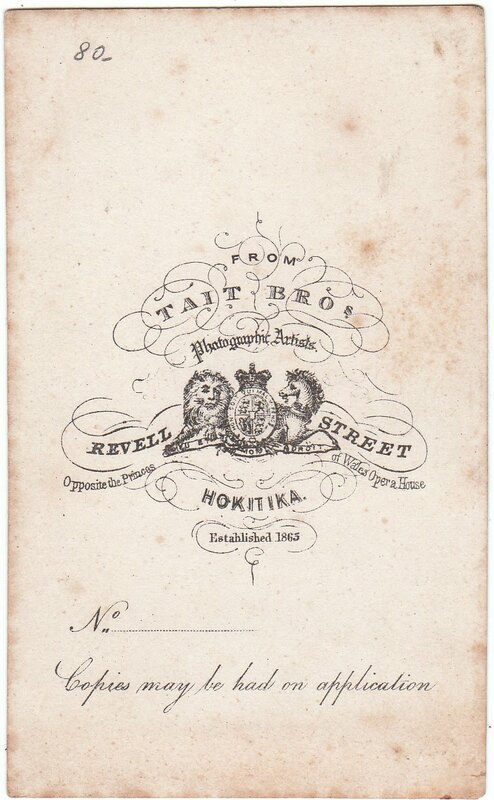 One of the firm of Messrs Tait Brothers, of Hokitika and Greymouth, is on a short visit to Charleston, principally with the purpose of taking views of local scenery. 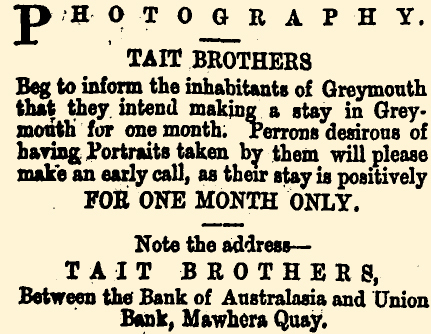 We have to acknowledge receipt from Messrs Tait Brothers, photographers, of Greymouth and Hokitika, of a card containing portraits of several hundreds, of well-known residents in Hokitika and Greymouth. 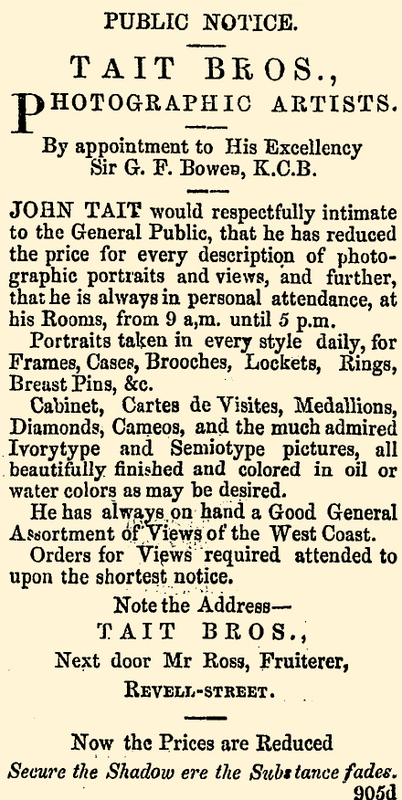 Every person on the West Coast who wishes to possess one of the best souvenirs of the early times ought to obtain a copy of this wonderful collection of portraits. 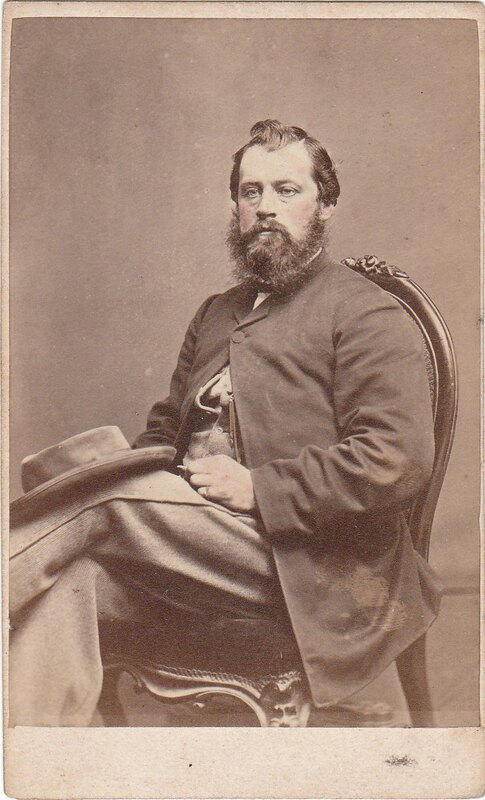 We have been favored with a copy of a photograph of his Excellency the Governor [Sir James Ferguson], who, during his stay in Hokitika, favored Mr Tait with a sitting. The likeness is perfect, and whether considered as a work of art or a memento of the recent visit of Vice-Royalty, is well worthy of inspection, and should find a place in every album. 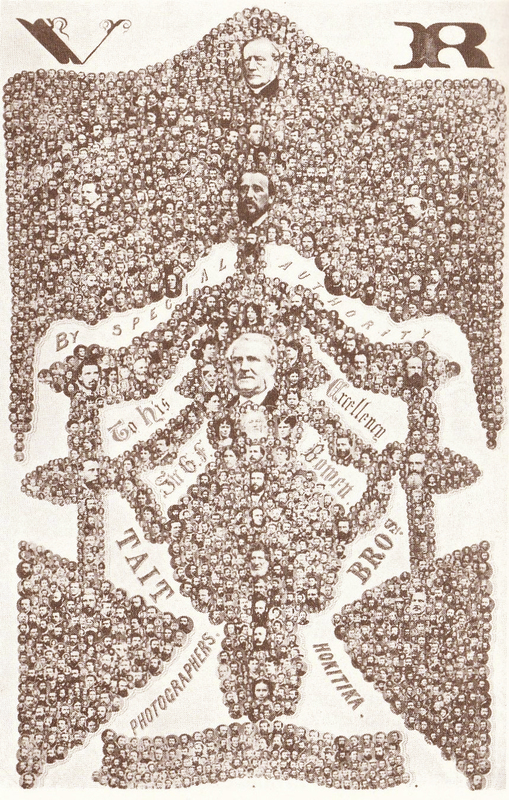 The larger portrait towards the top is that of Bishop Harper and the portrait in the centre is that of the Governor Sir George Ferguson Bowen. 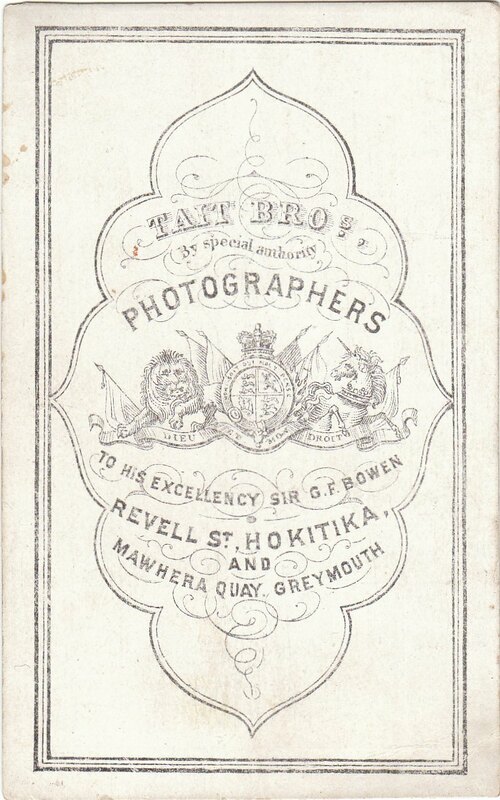 Another copy of this montage by Tait Bros was published in Photography in New Zealand by Hardwick Knight, page 136.
above - a carte de visite by Tait Bros of Revell Street, Hokitika and Mawhera Quay, Greymouth. 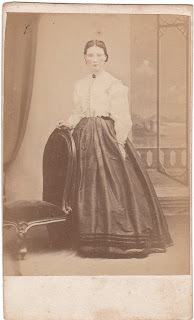 This lady appears in the Tait Bros. montage. 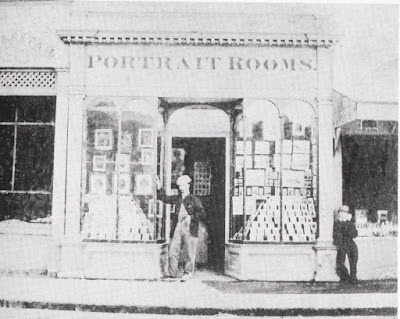 On Saturday evening, in the shop window of Messrs Tait Brothers, Photographers, the likeness of Butler, who was recently tried in Dunedin, and acquitted, together with the likenesses of Mr and Mrs Dewar who were murdered, were exhibited, and attracted a large number of spectators. We have to acknowledge having received from the hands of Messrs Tait Brothers, photographers, an exceedingly well executed photograph of the scene at the christening of the Ross Goldmining Company's water engine, taken immediately previous to the christening. The view comprises the whole of the buildings, the workshop, engine shed, water shed, poppet head and fluming, belonging to the company. From the engine shed to the water wheel, a large display of bunting of all nations is shown, and the water appears in full play at the end of race. 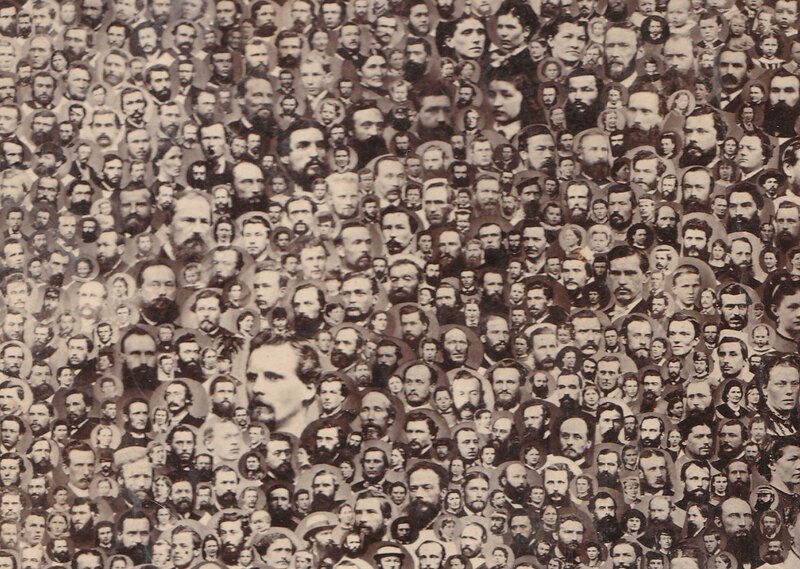 In front of the whole, stand a large assemblage of people amongst whom can be easily distinguished each of the directors of the company, tho secretary, and mining manager, together with the various members of the Hokitika and Ross public bodies, and a number of ladies and gentlemen who were present at the ceremony. 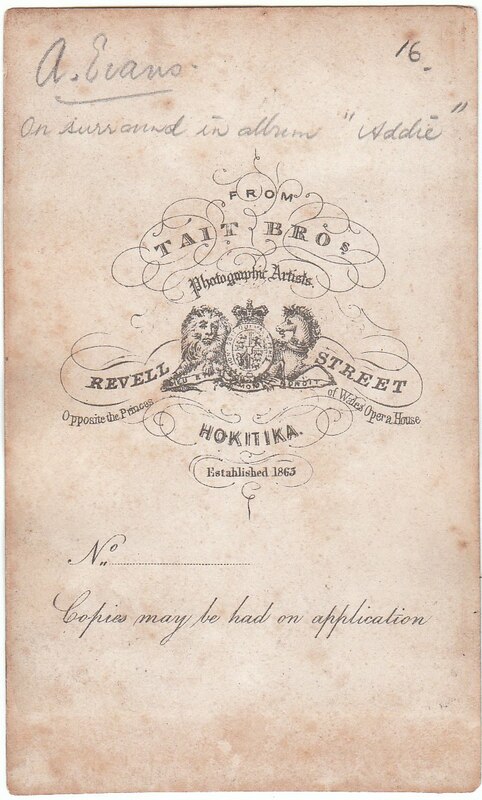 As a picture, it is one of the best Messrs Tait have ever taken by their instantaneous process. An excellent conception of the over-ground operations of the company is rendered, and many of the likenesses are at once striking and unmistakable.